SCVHistory.com | Hart Park & Museum | Wm. S. Hart's Newhall Property Acquisitions (& Subsequent), NHMLA 1989. 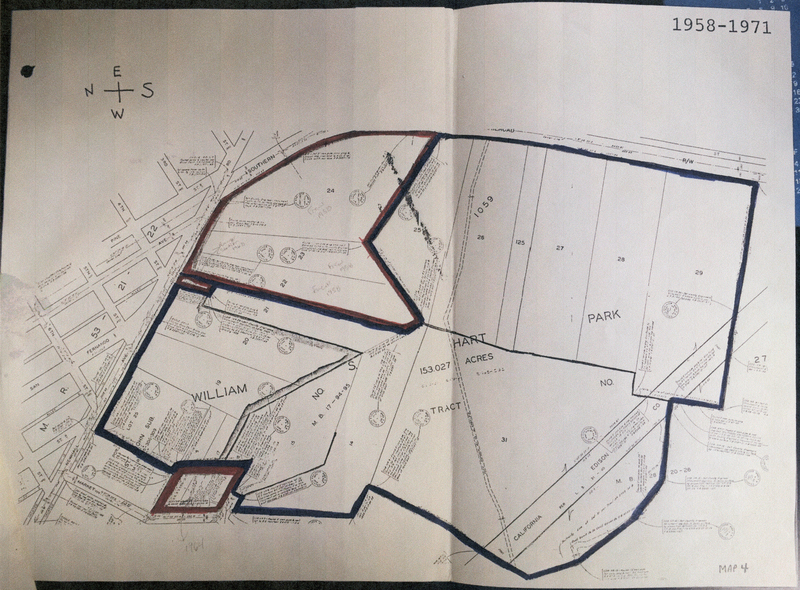 Survey of the Acquisition of Property Comprising William S. Hart Park. Natural History Museum of Los Angeles County, February 1989. Author Tom Sitton was curator and head of the History Department at the Los Angeles County Natural History Museum from 1974-2006. See Also: Frew addition (1958). The entire area comprising William S. Hart Park initially became the property of the King of Spain upon the occupation of California by Gaspar de Portolá in 1769. The property became Mexican territory in 1822, when Mexico became independent of Spain and occupied California. On 22 January 1839, a tract of some 48,611 acres, including the future Hart property, was granted to Antonio Del Valle as part of the Rancho San Francisco. After the American acquisition of California as a result of the Treaty of Guadalupe Hidalgo in 1848, the Del Valle title to the ranch was confirmed in 1851. The future Hart property was acquired by Henry M. Newhall in 1875, and in 1883, his heirs granted their holdings to the Newhall Land and Farming Company, which owned most of the land in the area until various parcels were sold to individuals after 1900. When William S. Hart first came to Newhall in 1918, he leased property from George Babcock Smith which became the core of the Horseshoe Ranch. In 1921 he decided to buy the property, and in that year he began purchasing lots that included the Smith ranch and Anderson home (see map 1). In February 1921, Hart purchased lots 19 and 20 of Tract 1059 from George Babcock Smith. These lots were the site of the Ranchhouse and "log cabin" (now the Gift Shop), and the future sites of the barn and related buildings and the retirement residence complex (located at the southern extremity) of the later 1920s. At the same time Hart also acquired the easterly portions of lots 17 and 18 (about half of each lot) from Smith. There were no improvements on these lots. The westerly portions were owned by Mrs. Armantha E. Thibaudeau, who also owned the southern section of the lot at the southeast corner of Newhall Avenue and Market Street, which abutted the westerly section of lots 17 and 18. In July, Hart made two additional purchases of property adjacent to the Smith lots. 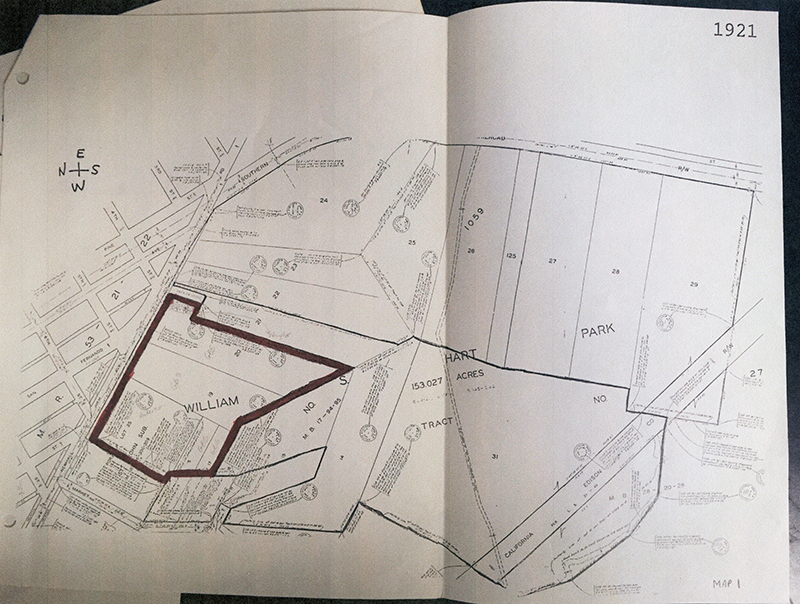 He bought a 5-acre plot on the west side (a portion of Lot 25, St. John Sub.) from Chloe Anderson. The property formerly belonged to James M. Gulley and later to Joseph H. Anderson. It included a frame residence which Hart used as a "Guest Cottage," a windmill (not the existing one), and a barn. The house was later moved (possibly to a location on Market Street), the windmill removed, and the barn demolished. Also on July 8, Hart purchased a 90' x 225' lot at the northwestern corner of Lot 21 of Tract 1059 from Franklin K. Naylor. This was located adjacent to a 50' x 125' lot that already had been selected as the site of a U.S. forest ranger station office near the street and a ranger residence and garage in the rear. When the ranger residence finally was built, Hart claimed that part of the structure was located on his property and offered to trade another piece of his land for the lot. The offer was rejected, however, and the U.S. government parcel became a peninsula when Hart acquired the land around it. The remainder of Lot 21 (which by then had only a 20' frontage on Newhall Avenue) was kept for the time by Naylor, who had a small frame house in the middle of the lot. 2. Land for the Retirement Residence. Once Hart decided to settle permanently in Newhall, he made plans to build a retirement residence and support buildings. From 1925 to 1927 he attempted to purchase all available land surrounding the hill upon which his mansion was built in order to provide seclusion from the outside world and wide-open spaces for his ranch. The property he acquired during these years included a vast hilly tract along the western extremity of the ranch, and the land surrounding the ranger station (see Map 2: the previously existing Hart property is outlined in blue; the new acquisitions are outlined in red). 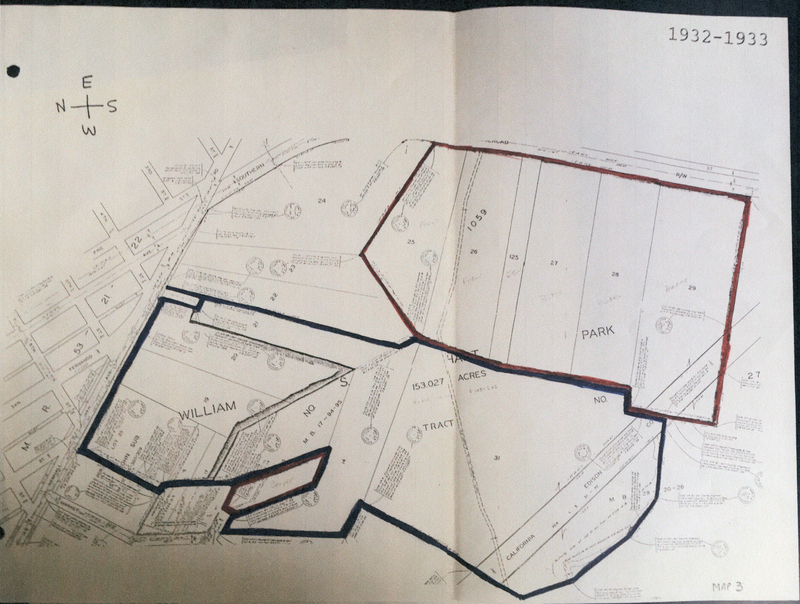 At some time in 1926 (prior to November of that year), Hart purchased Lot 14 of Tract 1059 and Lot 31 of Tract 2703 from Daisy Quisenberry (or Quissenbery), who had owned the property since about 1916. There were only minor improvements assessed at $100 on this property since 1917. 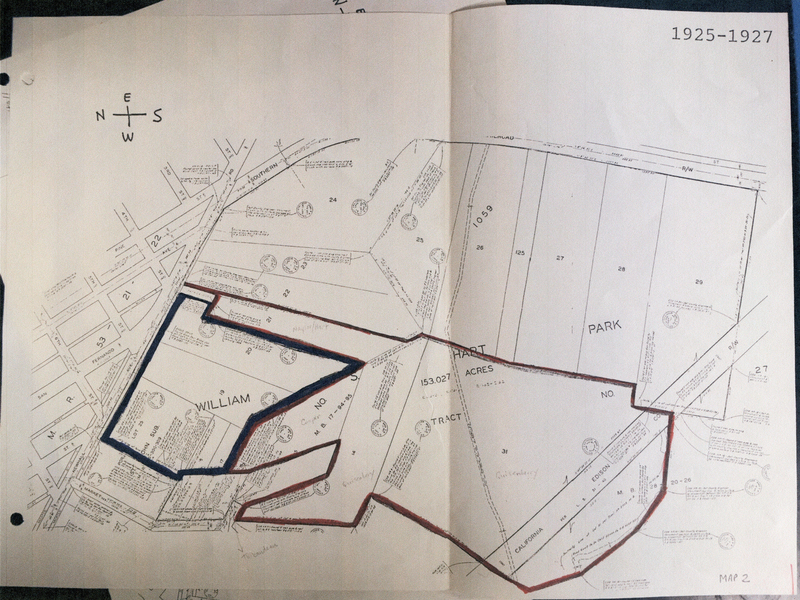 In 1926 Hart also purchased the eastern half of Lot 16 of Tract 1059 from Mrs. Armantha Thibaudeau, who owned considerable property in the area. This lot abutted the southern border of the northwestern portion of Hart's ranch and was unimproved. A year later, Hart purchased the eastern half of Lot 15 of Tract 1059, located on the western side of the ranch between the two parcels mentioned above. This latest purchase was made on 4 April 1927, through Hart's attorney, James G. Scarborough, who acquired the property from Alphonso G. Cooper (who retained the western half of Lot 15). A small improvement on the property at that time evidently was removed soon after Hart's purchase. In November 1927, Hart purchased another parcel bordering his existing land on the northeast. Lot 21 of Tract 1059 had been owned by Franklin Naylor, who sold a small portion on the northwest corner to Hart in 1921, and the forest ranger office and residence was located in the center on the northern tip. In 1926 Naylor sold the remaining portion of the lot (about 4½ acres), along with his house and other structures, to Ed Hart of King City (no relation to William S. Hart). In 1927 the new owner offered the property to the actor, who considered the lot a "menace" since it was located so close to his residence and valued the buildings "worthless." He offered $4500 for the property, though he believed it was worth only half that amount, and consummated the sale in November. The property, the site of the old Naylor residence, surrounded the forest ranger property. After Hart completed the buildings for his retirement residence, he continued to acquire property adjacent to his Horseshoe Ranch as it became available. In the early 1930s he purchased three parcels, the last additions to the ranch during his lifetime. The smallest of these filled a gap along the western edge of the ranch. The other two consisted of six lots fronting along the Southern Pacific Railroad tracks on the east side and bordering his own property on the west (see map 3). The first of these three transactions was the purchase of the western portion of Lot 15 of Tract 1059 on 23 June 1932. The lot, surrounded on three sides by Hart's property, formerly belonged to Alphonso G. Cooper and had a moderate amount of improvements at the time (probably a house). Another 1930s purchase, possibly in late 1933, was Hart's acquisition of Lots 25, 26, and 125 of Tract 1059. These lots were located on the east side of the ranch along the Southern Pacific Railroad right of way and south of the property of Thomas Frew, Hart's neighbor on the northeast. Formerly the property of William J. Purrucker and his ancestors since the turn of the century, the property had only minor improvements, possibly a cabin or small barn. The last addition to the property in Hart's lifetime, according to the chain of title, was the purchase of Lots 27, 28, and 29 of Tract 2703, recorded on 21 October 1933. This property also had belonged to the Purrucker family and was purchased from B.L. Bates. The parcel, which comprised the southeast portion of the Horseshoe Ranch, contained only minimal improvements on Lot 27 which almost disappeared by 1935. Lot 29 contained part of a Southern California Edison Company right of way which extended through the southern portion of Lot 31 of Tract 2703. With the purchase of these three lots, the Horseshoe Ranch was complete. The Los Angeles County Parks and Recreation Department began operating the Horseshoe Ranch as a County park in 1957. In order to increase the land available for recreational use, the County purchased three parcels adjacent to the Horseshoe Ranch which expanded the park to its present limits. These additions included the Frew property in the northeastern section, a small lot on Newhall Avenue where the ranger station was located, and half of three lots on the western edge along Market Street (see map 4). In 1958 the County of Los Angeles purchased the property located in the northeast section of Hart Park, the parcel consisted of Lots 22, 23, and 24 of Tract 1059, which bordered the Horseshoe Ranch on two sides and followed the curve of the railroad right of way along the east. The property included a house, built in 1926, which now serves as a Parks and Recreation Department office, a small outbuilding, and a barn. In 1968 the County purchased the parcel in Lot 21 of Tract 1059 which contained the former U.S. forest ranger office, residence, and garage, which had caused Hart so many headaches. The ranger headquarters had been transfered in the 1930s, and since that time the buildings on this parcel had been used for storage. The County finally purchased the parcel and removed the buildings so that the land could be used for a parking lot. The final additions to Hart Park were two parcels purchased by the County by the early 1970s. One parcel consisted of the western half of Lot 18, located on Market Street, which was probably acquired about 1964. The other parcel included the western halves of Lots 16 and 17 of Tract 1059, owned by the Christ Lutheran Church [sic] and sold in 1971. All three of these lots had formerly belonged to Mrs. Armantha Thibaudeau until April 1946, when they were purchased by the first of several buyers. None of the lots contained improvements through the early 1930s. 1. D.R. Duffy to Lloyd P. Hiatt, 11 February 1971 (with Chain of Title from Title Insurance and Trust Company), box 10, Collection 1192, Seaver Center; Arthur B. Perkins, "Rancho San Francisco: A Study of a California Land Grant," Southern California Quarterly, 39 (June 1937): 99-126. 2. Newhall Signal, 4 February 1921; Los Angeles County Deeds, Book 16: 319, Los Angeles County Recorder's Office; and Los Angeles County Assessor's Records, Book 104, Los Angeles County Archives. 3. Newhall Signal, 8 July 1921; Los Angeles County Deeds, 370: 253; Los Angeles County Assessor's Records, Book 104. 4. Newhall Signal, 8 July 1921; Los Angeles County Deeds, 477: 226; Los Angeles County Assessor's Records, Book 104; Letters to and from William S. Hart regarding forest ranger office and residence, box 2, William S. Hart Collection, Seaver Center. 5. James G. Scarborough to William S. Hart, 16 November 1926, box 2, Hart Collection; Los Angeles County Assessor's Records, Book 104. 7. Los Angeles County Deeds, 6616: 260; Los Angeles County Assessor's Records, Book 104. 8. Newhall Signal, 20 May 1926; Hart to Scarborough, 6 October 1927, box 2, Hart Collection; Los Angeles County Deeds, 7982: 315; Los Angeles County Assessor's Records, Book 104. 9. Los Angeles County Deeds, 11682: 113; Los Angeles County Assessor's Records, Book 104. 10. Ibid. ; Deeds 12442: 305 (?). 11. Ibid. ; Deeds 12365: 350. 12. Newhall Signal, 6 May 1926; Los Angeles County Assessor's Records, Book 104; Los Angeles County Board of Supervisors Minutes (abridged list for Hart Park), 18 September 1958. 13. Newhall Signal, 28 June 1934; Los Angeles County Assessor's Records, Book 104; Board of Supervisors Minutes list, 23 January 1968. 14. Los Angeles County Assessor's Records, Book 104; Board of Supervisors Minutes list, 7 January 1964, 26 July 1971. MU8901: Download individual pages and maps here.